Following the last post about this, it didn’t turn out to be as easy as I thought it would be to drill through the enamel flu pipe! I had the right metal drill bits but they just made no impression in the metal surface. It didn’t help that I was drilling from the side and couldn’t get a lot of force behind the drill but there was no way I could get the holes in it. So, thanks to living in an area with mixed uses and a variety of services, I managed to get the holes drilled by the metal fabricator and railing manufacturer just up the road. I cycled up there thinking i”d also have to then go to a different place but the guys there were very helpful and said it was no problem to do two quick holes. It literally took him 3 minutes and no charge. It was fairly easy to then get the damper fitted into the pipe then fit the pipe back into the liner, screw the register plate back up then fire cement the pipe back in. The damper has made a real difference to how quickly the wood burns and also to the amount of heat coming out. The burn rate isn’t quite as low as i’d hoped but much better than before. 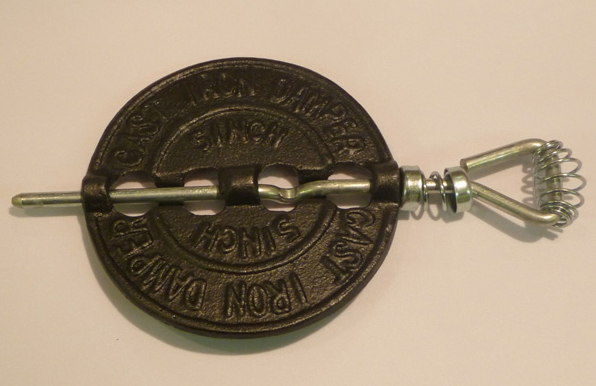 A damper with fewer holes could be an idea and I’m thinking about fixing stove fire rope to the damper to further limit the air flow but so far it’s done the job. Since we put the stove back in, following the installation of the new hearth stone, it has been drawing really slowly and keeping a nice slow burn. This has meant we’re getting through far less wood than last winter, when we were chucking wood on and needing to keep quite a high burn to get a decent internal temperature in the house. I had thought this was mainly to do with the new external insulated render, which we had installed in March last year. 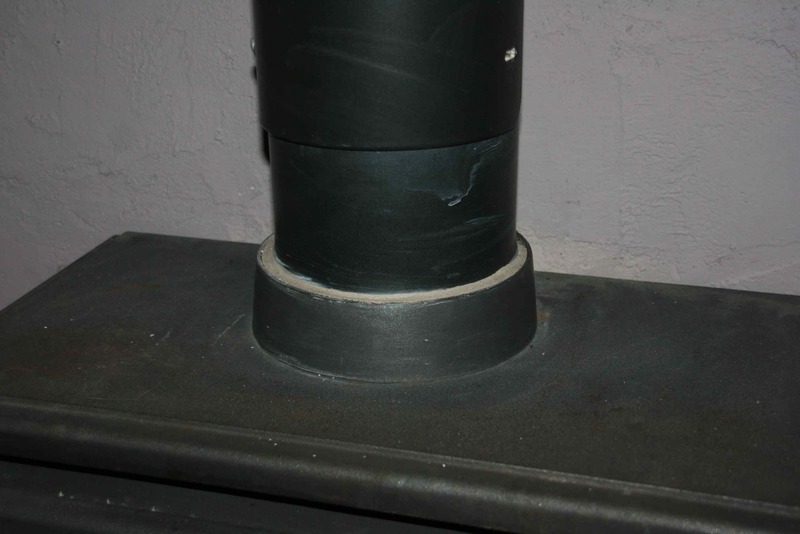 It turns out, it was far more to do with the fact that the flu pipe which comes up directly from the stove wasn’t even connected to the chimney liner! 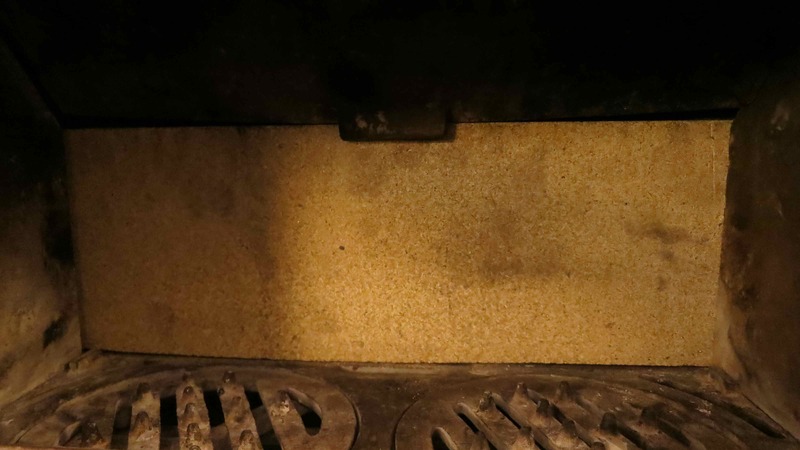 It was burning slowly because there was very little air flow up the chimney. I had discovered smoke collecting in the loft. 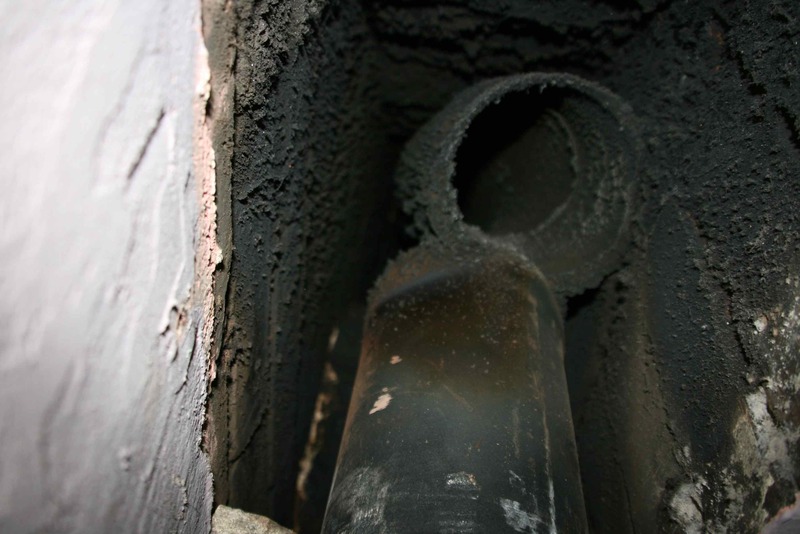 This had been an issue we experienced before we had the chimney lined and was due to smoke getting through the small gaps in the stacks mortar. 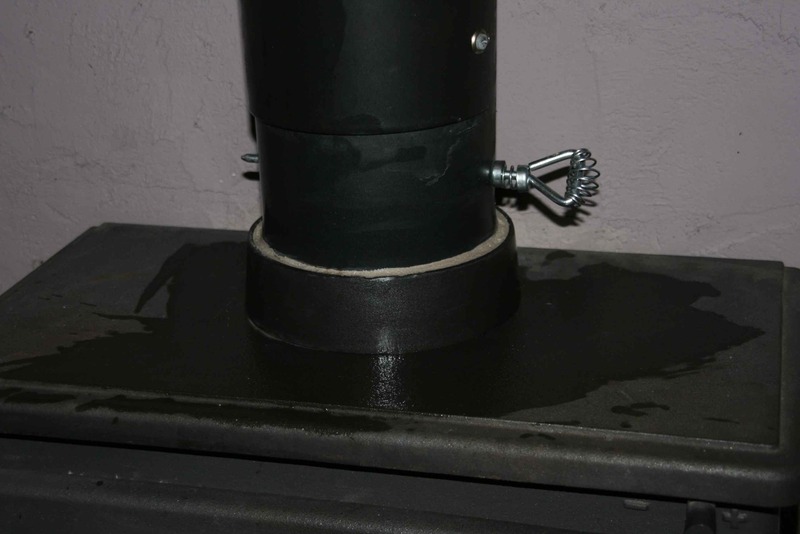 The idea of the liner was that the smoke wouldn’t even enter the main chimney, but be carried up the liner and out from the cowel at the top of the chimney pot. Claire had already called a chimney company who had said it sounded like a torn liner. 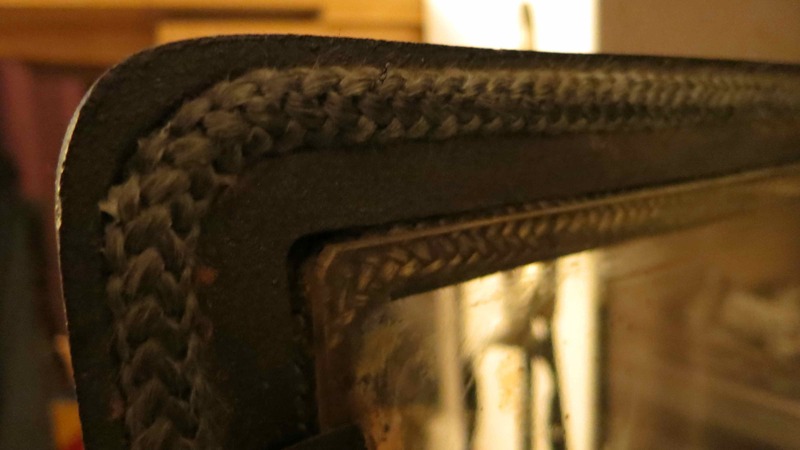 So, my hunch was that there wasn’t a liner tear and thought immediately it was a connection problem, mainly because the stove had recently been re-fitted. First thing I saw when I inspected it yesterday morning was the image above! It took about 1.5 hours to get the register plate off, check the problem, fix the pipes together again and fix the register plate back up + clean and hoover all around. Not bad and I know it’s fairly easy to do if the stove needs to be taken out again. 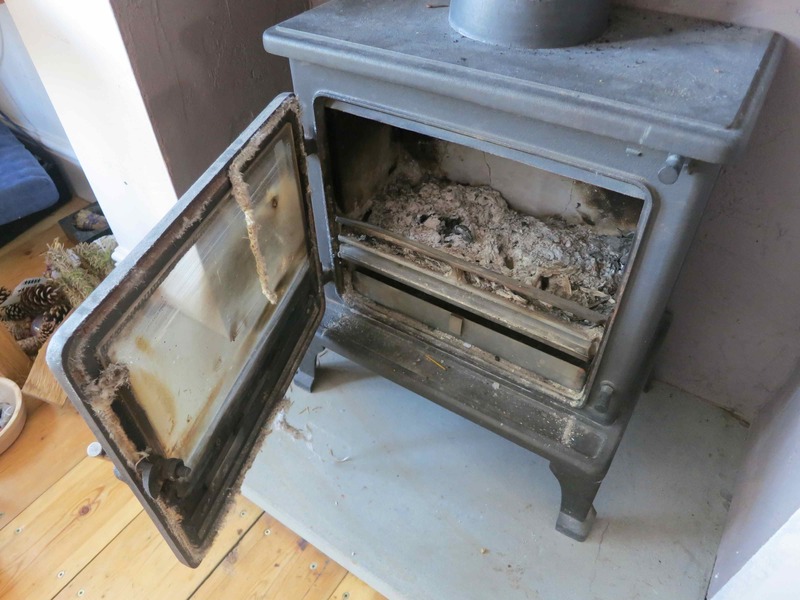 The result of the re-connection is the stove is eating the wood up at a fierce rate! Maybe twice the rate as before but a bit less heat coming out into the room. 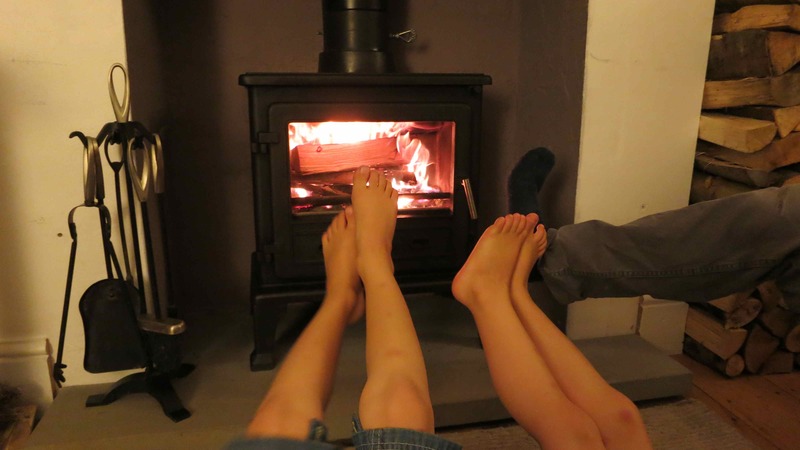 Much more heat is now just going up the chimney and not being held in the stove. 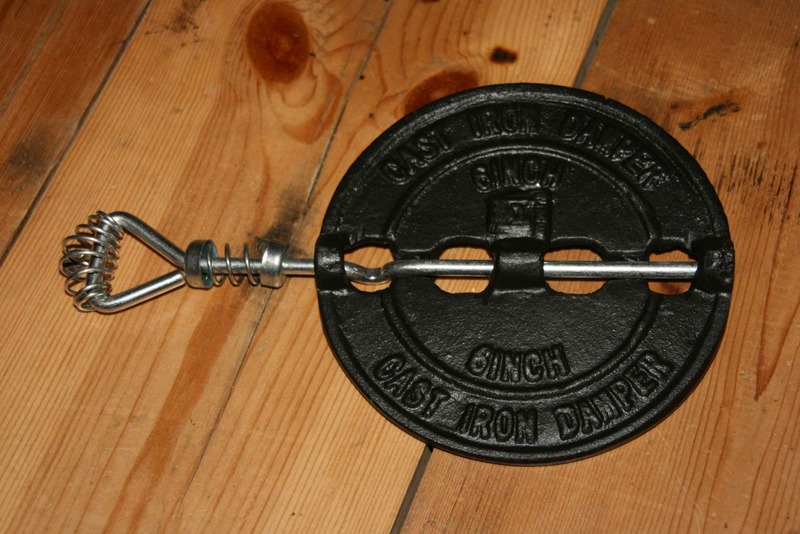 The solution to this problem is fairly simple: a stove damper. 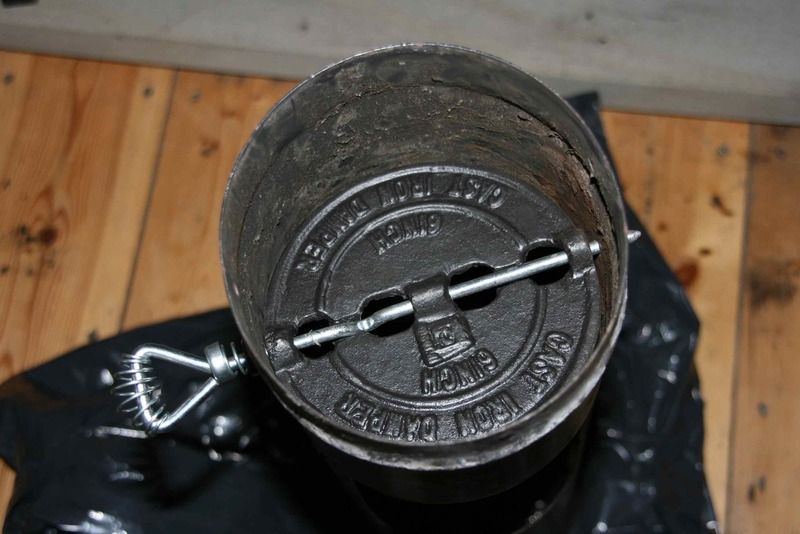 This fits into the flu pipe, above the stove and below the service door, and can be turned to let more or less air up the liner. Some air is always allowed up through it though. The chrome handle matches the stove and it was only about £13. This will hopefully allow us to control the fire much more precisely and be able to leave it on very low while we’re out of the house for a few hours. It does require two holes to be drilled in the flu pipe but this shouldn’t be a problem (famous last words!). The great thing about spending time at home is that I can carry out all sorts of little science experiments and observations about the things around us. The latest one was about log burning and internal temperatures. I wanted to know how long it takes for the internal temperature to go up, using the wood burner. So, this morning, after a cold night, the temperature was 17.8 degrees and after an hour of the fire being on, this went up by 1 degree. So, after the initial hour when the stove was heating up and increasing its output, the temperature went up by 1 degree every 30 minutes, so in just over 2 hours, it went up by 3 degrees. 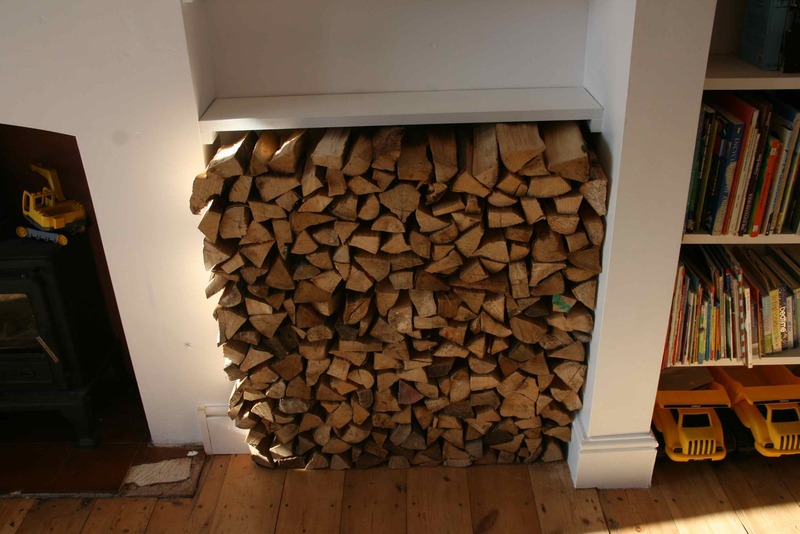 The other thing was to work out how many fires the pile of logs by the stove would give us. My first guess was about 1 week, but now i’ve worked it out properly, it works out as 16 days! Each fire uses 6 cm of logs (about a row) and 12 logs per row. Once the fire is on a up to a good temperature, I only need to put on a single log at a time to keep it going. 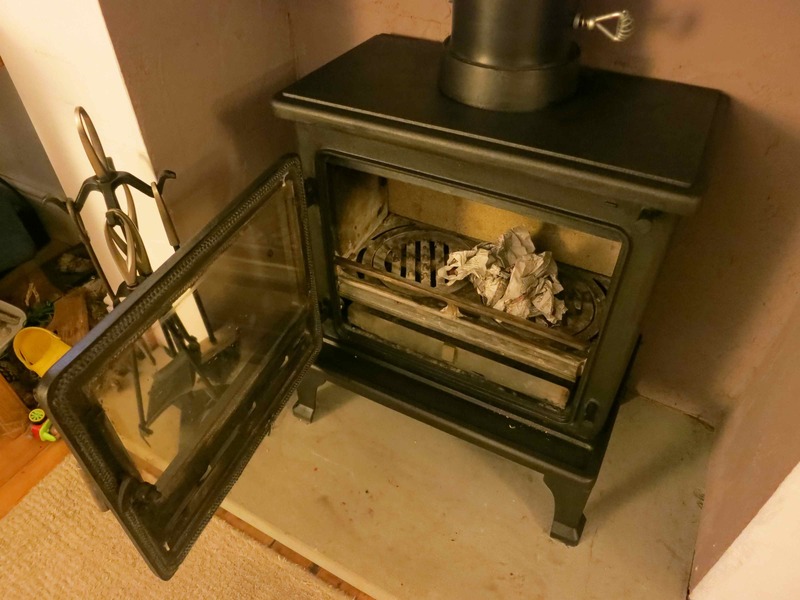 The difference between the inside and outside temperatures last year before started to use the stove was 9 or 10 degrees. We would get the temperature up to the low 20’s in the evening with the stove on, then in the morning, it would be as low as 16 or 17 degrees, meaning quite a large overall drop during the night. So far this year, before we just lit the first fire last night, the temperature difference between inside and outside was something like 12 or 13 degrees. The outside temperature was around 6 degrees for a couple of days in the morning, while inside it was around 19 degrees, giving a 13 degree difference. This was after two very cold days, with clear nights. Since last winter, we have had the loft hatch replaced with a new and much less draughty one, had the double glazing replaced with new and had the external insulated render installed. The hypothesis is that more heat will be retained within the house and for longer periods. I also hope that less heat will need to be produced in order to raise the temperature inside (due to less heat escaping and less cold air entering). Last night was the 1st fire of the year. The temperature was 21.6 when we went to bed and in the morning, it was 19.2 degrees, giving a 2.4 degree drop over the 8 or 9 hours with a clear night. The outside temperature this morning was 9 degrees, giving a 10 degree difference. So, the difference seems to be around 10 degrees still but the temperature drop was only 2.4 degrees, compared to last year when it was something like 6 degrees. Seems like progress but we haven’t had the really cold weather yet! The other thing i’ve noted is the amount of wood which we just used, out of the stack by the stove. For the 4 hour fire last night, we used about 1/7 of the whole stack, meaning about 7 days (1 week) worth of fires, burning between low and medium heat. Time for the allotment to wake-up…! We’ve been slowly waking up to the fact that now is the time to kick start our allotment ambitions. If we had been making great progress with our growing this past year, we would now be pulling up all the plants and turning over the compost etc. As it is, we’ve just been over to the allotment and done an hour of digging, but there wasn’t much to pull up out of the raised beds. Claire and I had a very rare opportunity to spend a small amount of time out of the house together without the boys, so we legged it over to the allotment. We took up all the raised beds, got the last tomatoes and rainbow chard out, pulled out the canes, stacked the raised beds behind the shed, dug over and cleared a section of the corner of the plot measuring 2 x 2.5 metres (5 m2). Not a bad start and given how much we got done in only 1 hour, we’re now thinking we can do the whole plot with forks and spades, rather than using a friend’s rotavator, which obviously uses petrol. The whole plot is roughly 100 m2, so it would only take 2 people about 20 hours to do the whole thing. This could easily be done over a few weekends and we’re going to try and go up there for at least 2 hours every Saturday and Sunday. The rough plan until the start of winter, is to clear the whole plot of weeds, raised beds, dead plants + move the raspberry bushes, pull back the black sheets and move the logs, branches and wood away. Next is the digging and rotavating, which we’ve now started. We’ll come back and do a more thorough dig and weed removal, but it’s a start and will help to get the process of the weather breaking down the soil going. Next is to add manure / fertiliser / compost, which is essential to improve the soil and boost the somewhat limited productivity. Based on what we’ve one today, we might keep going with the digging and clearing then add manure as we go. It’s all a learning process and we’ll just see how it works out. Another thing we’re going to try is green manure, which could be mustard, which is grown during autumn and winter, then dug into the soil, which then breaks down and adds nutrients back in. 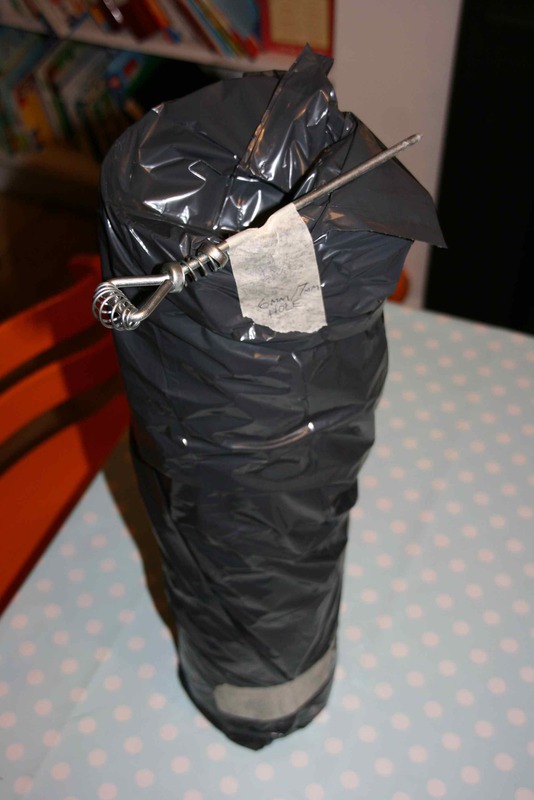 It also helps to retain the nutrients from the compost and manure over winter. We’ve got a long way to go but it was an amazing feeling doing that small amount of work there today. Very inspiring and really good exercise! There’s something about working the soil for a productive end which is just amazing. I was talking to Jamie the other day about the seasons and how it’s coming up to Autumn, which would then turn to winter. I asked what he was looking forward to about Winter (trying to put a positive spin on things!). It took him about a second to say Christmas! We started to go through all of the reasons why winter is actually a pretty good season. Log fires: One of my favourites. This year, I worked out how much wood we used from the previous year and ordered that much in early spring. It’s all been chopped and stacked since April and we should have enough to last till March 2012. Log fires are awesome and really raise the spirits on a crap winter day. Jamie and Jac were loving coming down from having a bath and standing in front of the stove while getting dry. Jamie even asked me about getting the fire lit in the middle of summer so he could do that. Insulated render: Now we’ve got the whole side and most of the rear of the house insulated, as well as the loft hatch re-done, the heat we do make by the radiators and stove should be kept in the house for longer. We’ve also had new windows front and back which has already made a difference. This should make the cold weather easier to live with. The boys birthdays: Jamie’s 5th at the end of October then Jac’s 3rd at the end of January. Always lots of fun and breaks up the season each side of Christmas. Halloween: Lots of potential for fun and excitement, as well as creative ideas for making things. Walking around with spooky lanterns and torches in the garden. Pumpkin pie (using pumpkins from the allotment – not this year but hopefully next!) and ales. Yum. Claire’s birthday: Last but certainly not least. The middle of February signals the approach of Spring and brighter and warmer times. A good way to finish off the season! We’ve officially run out of Eco logs. We had half a ton delivered and they’ve lasted 3 months. That’s pretty good considering the stove has been on pretty much every day and we’ve had some very cold weather. So far this Winter, the total used is about a ton, the other half being seasoned hard wood. I think we’re going to have to go on a massive wood-scrounging mission from now until this coming Autumn! So far, i’ve got 3 people at work on the case but if ANYONE in Gloucester has any spare wood – you know who to call! !